I asked for a quote and paid for the barrels and the fedex shipment and they never get to us, they never answer the phone just send emails and or text messages telling us just lies. This products were already sale to customers that now are pretty mad at us as we can deliver the products. I paid these thieves for 100 barrels. Long story short all I got were lies about delivery dates that came and went, drivers that were unaccounted for and more lies about refunding my money. For several weeks I've been trying to get my refunded and have gotten nothing but lip service. I've been in contact with the South Carolina BBB and other agencies.. I'll update this with periodically. I'm you've can similar issues with Dirtcheapbarrels please tell your story here. My intent is to stop this fraud and assist others recoupe their losses. We ordered a shipment of barrels from them. They required pre-payment, which should have been our first red flag. Long story short, barrels never delivered, they promised to refund $ multiple times but it never went through. It is a complete scam - stay away from them. I ordered 5 barrels from them. Mary Hatten ([email protected]) replied with pricing and inventory. Looking at it now, their inventory is more than too good to be true. They don't post their inventory on their website. Their website contains a link to request a quote. Once you do this, they send a list of barrels and prices. 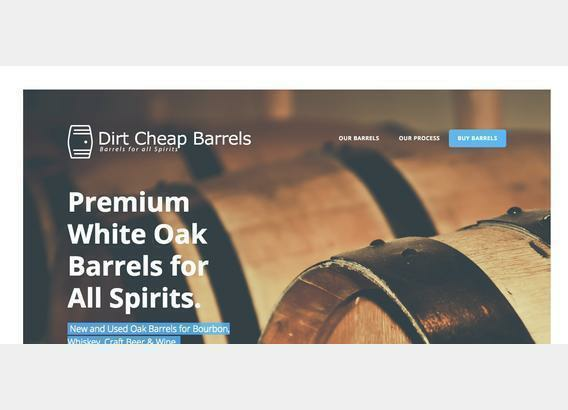 Basically, they said they have 5, 10, 15, 23, 30, 53, 60, and 80 gallon barrels from any trendy bourbon distillery you can think of (JD, Woodford, buffalo trace, beam, heaven hill, wild turkey, etc). Mary told me that everything is in stock and they were "dumped" by the distilleries. Why would the distilleries dump these barrels if these guys can sell the mfor $200+? And why would Jack Daniels ever use a 5 or 10 gallon barrel? If they did, why would they have them in large numbers and be throwing them out or giving them to DCB for free? We agreed on pricing for the 5 barrels. Mary emailed a bill and shipping invoice and asked for payment saying I would get a receipt and the barrels would ship the next day. The following day, she re-sent the bill. I did not pay. Instead, I asked for shipping confirmation and a tracking number. Mary stopped replying and I haven't heard from them since. I bought a barrel in September and it is January and I don't have it. They kept saying it would be there tomorrow, etc.